Published July 31, 2018 at 4:00 p.m.
Dressing sharp shows self-respect and changes the way people react to you. The adage is one of a few lessons Milwaukee-area stylist Jeff McAlister imparted upon a room filled with about 40 teens on Friday, July 27. 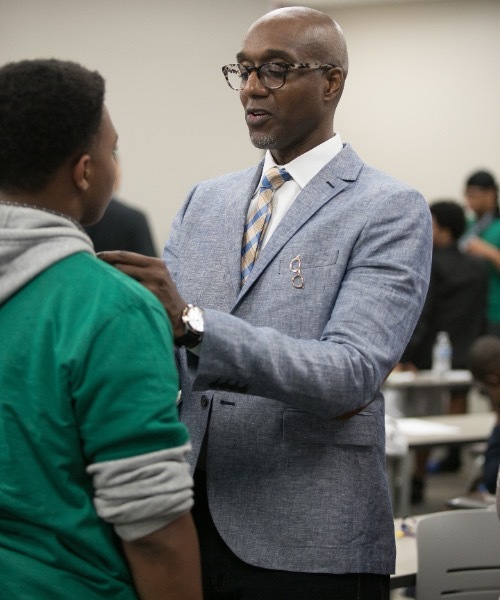 Jeff McAlister, a Milwaukee-area stylist, knots a tie for a participant of the African American Male Initiative Summer Institute at Concordia. The young men were there as part of the fourth annual African American Male Initiative (AAMI) Summer Institute, where teens from 26 school districts throughout the state are selected to stay overnight on the Concordia University Wisconsin campus to engage in learning and personal growth activities over the course of four days. The intent is to expose them to positive African American role models and peers, and encourage them in their pursuit of higher education. This year, a total of about 140 students attended the four-day event, held annually on the CUW campus. of beautiful Lake Michigan shoreline. After listening to some of McAlister's insights on the subject of "dressing the part," the teens were gifted a tie from the Men's Wearhouse location in Brookfield. Sam Barnes, store manager, was on hand to demonstrate various knots. For some participants, like Nasir Wartchow of Cudahy High School, it was the first time he had ever tied the accessory. He came up a bit short – literally – on his first attempt. Wartchow successfully managed the steps, but in the end, the tip of his tie only reached to his midriff. Nevertheless, he owned the look and was proud of his accomplishment. "If I ever wore a tie to dances or something, it was always a clip-on, and my dad doesn't wear a tie for work so he doesn't really know how to tie one," Wartchow explained. "For my next dance, I'll be able to tie my own tie now." The African American Male Initiative is an effort of the Concordia-led Closing the Achievement Gap Consortium. In 2012, a group of educators set out to remedy the abysmal achievement gap that exists in Wisconsin schools (the largest gap in the nation). The group formed the CAGC which seeks to "embrace and change, with all deliberate speed, school practices, instructional methodology and school structures that perpetuate achievement and/or opportunity gaps in Wisconsin schools." Concordia is the consortium's sole higher education partner. CUW Education Administration Director Dr. Elliott Moeser serves as executive director for the CAGC. The CAGC undertakes various other efforts throughout the academic year to fulfill its mission. In addition to the AAMI, the consortium piloted an African American Female Initiative this summer that follows the model of its predecessor. 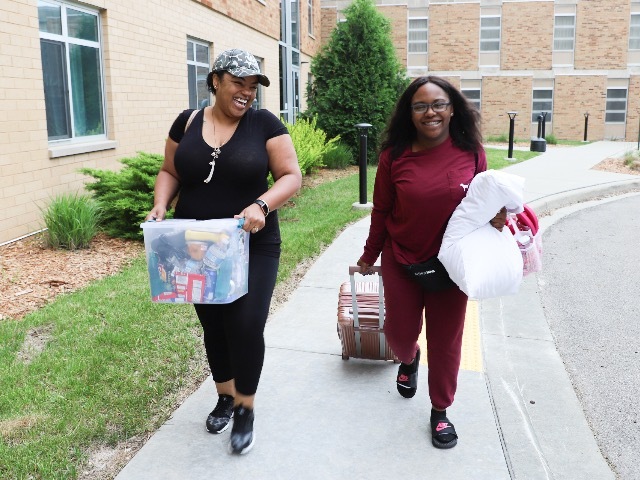 women stay overnight on Concordia's campus and engage in personal growth activities. Throughout this week's AAMI institute, the participants were exposed to numerous lessons in addition to McAlister's – like how to mind their mental health, be financially literate and succeed in an interview setting. The teens also went on excursions to various destinations in Milwaukee, including a visit to Miller Coors to meet with a top black executive and a stop in Menomonee Valley, a budding entrepreneurial site within the city. They also made time for fun and games throughout the week, taking in a show at the movie theater and enjoying a group cookout. Wartchow admits his mom initially forced him to attend his first Summer Institute last year, but the decision to return was all his. "They're teaching us to be leaders and positive role models in our community," Wartchow said. "That's why I wanted to come back, and I'm coming back the next two years, too." 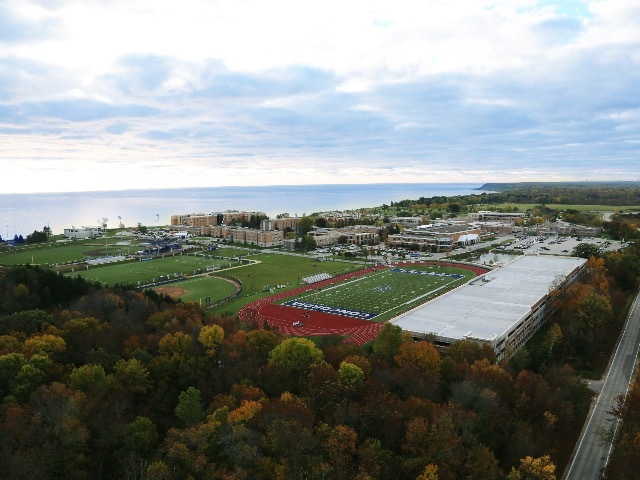 Learn more about Concordia University Wisconsin at cuw.edu.